As smoky skies from the wildfires burning throughout B.C. persist, air quality remains poor throughout much of the province, including in Metro Vancouver — but some regions have seen a reprieve. According to the B.C. air quality data map, Comox Valley, West Shore, Victoria, southwest Metro Vancouver, Castlegar, Smithers and Fort St. John and the eastern Fraser Valley had a 10+ rating as of 5 p.m. PT. Tuesday, indicating a very high health risk. At this risk level, people are recommended to reduce or reschedule strenuous activities outdoors. In a release, Metro Vancouver also issued a warning to people who are particularly vulnerable to the smoke. “Be aware of people who should take extra care, including anyone with chronic conditions such as asthma, heart disease, or diabetes, as well as pregnant women, infants, young children, and the elderly,” it read in part. According to the map, shades of red indicate a high health risk , shades of orange and yellow indicate a moderate health risk, and shades of blue indicate a low health risk. Metro Vancouver also issued a warning of health risks caused by high amounts of ground-level ozone. The district said ground-level ozone is formed when nitrous oxides — created by burning fuels — and the emissions from solvents — like paint, gasoline, industrial coatings, glues and nail polish — react in the sunlight. Several areas were classified as low risk on Tuesday morning, but the air quality dipped as the day progressed. 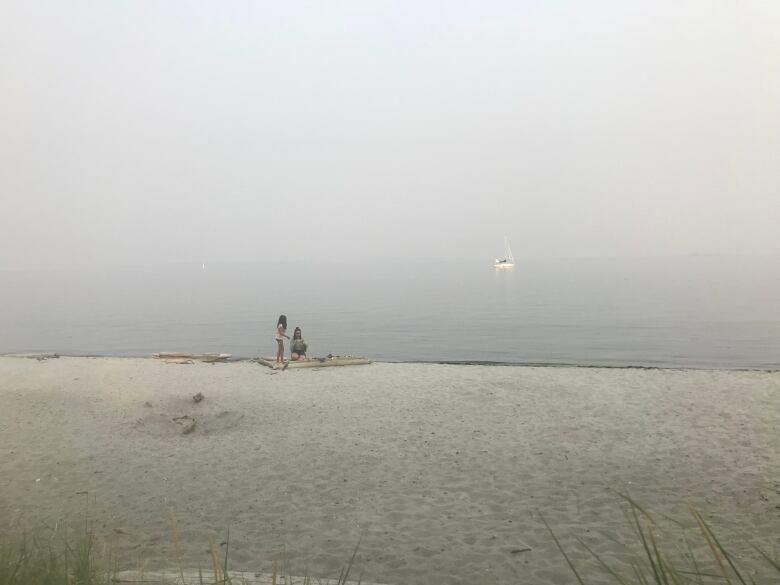 High pressure has pulled smoke away from the Interior towards the coast, and continues to trap smoke at the surface, according to CBC meteorologist Johanna Wagstaffe. An approaching front from the northwest will begin to flatten the high-pressure system beginning on Wednesday, although a new westerly flow may actually enhance smoke across B.C.’s Interior and Alberta. But relief could come by Thursday, as a front tracking through much of B.C. could bring scattered showers, cooler temperatures and the potential for thunderstorms. Despite the layer of smoke blocking some of the sun’s heat, seven temperature records were broken across the province on Monday. Temperatures in Squamish climbed to 35 C, and 33 C in Abbotsford and Agassiz.